Earlier this month one of my school auction clients returned to a non-traditional space that fits their event well. 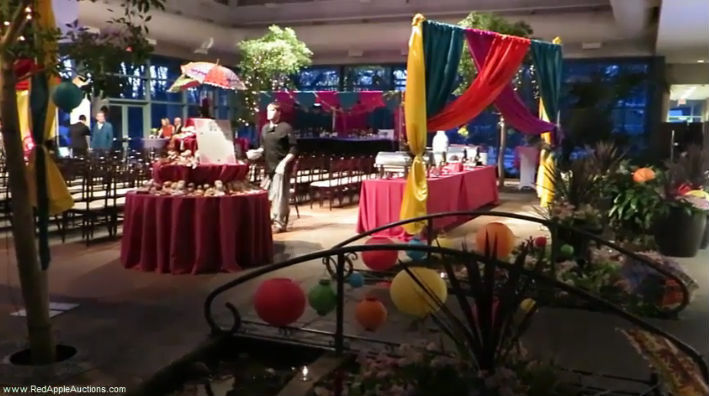 The venue is an atrium at the nearby botanical gardens. Their school auction themes have run the gamut, and this year, the committee opted for colorful Mumbai. In the video you’ll see the elements the Auction Chair incorporated into the evening. Even without decorations, the atrium is beautiful (and the snow outside made it even more so, I think), but this is a school that enjoys their themes and does a nice job of bringing the theme to life in this space. Many of the guests, especially the women, dressed in Indian fashions this year. During one of my consultations with this school, I shared photos from two other auctions I’d worked which had a Mumbai theme. One event had been a school auction from several years ago; the other was from an event I’d overseen last fall in Nashville, TN. Both events had used professional props and authentic-styled furniture. As this school had a stricter budget, the handy auction chair took the ideas she saw in my photos and — using some ingenuity and basic sewing techniques — re-created it. Here’s one example: She bought yards and yards of fabric on sale online, rented the pipe, and draped the fabric to re-create what she’d seen in my photos. This wasn’t as elaborate as the professionally staged props I’d shown her, but the effect was perfect for this size of group. Another cool feature: Though it’s not in the video, a flash mob performed by the teachers was part of the evening’s entertainment. How very Bollywood! 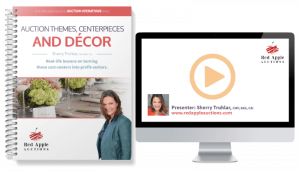 Want more ideas to get your school auction theme off the ground? Check out the details of the program.